Nobuo Kubota (b. 1932) left behind a 10-year career as an architect in 1969 to become one of Canada’s pre-eminent intermedia artists. For the past 50 years Kubota has performed, recorded, published, and exhibited internationally. He has produced an astonishing array of disciplinary hybrids including sound sculptures, performance-video installations, three-dimensional poems, and improvisational-art music. Kubota’s early fascination with jazz inspired him to form The Artists’ Jazz Band with visual artists Gord Rayner, Bob Markle, Graham Coughtry, in 1962. In 1974, Kubota joined Canada’s seminal free-music improvisational group, CCMC, with Michael Snow, Casey Sokol, Larry Dubin and Al Mattes. They opened the Music Gallery in Toronto. By the 1990s Kubota’s musical and visual sensibilities converged blurring disciplinary borders with a fully integrated intermedial creative practice. 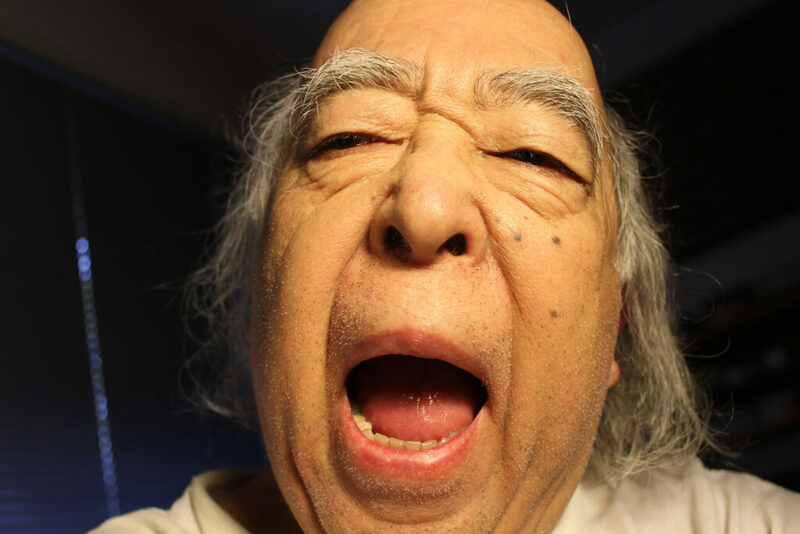 The improvisational music process combined with his cultural background and interests in Kabuki, Korean storytelling and Zen resulted in Mouth Mechanics (1999), a unique form of sound poetry and performance video. Kubota’s Phonic Slices exhibited in Toronto in 2001 featured a collection of three-dimensional poem-bookworks: Phonic Slices, Deep Text, Phonic Traces. The exhibition was a paradigm of zonal interference where seeing, reading and hearing challenged traditional taxonomies blurring disciplinary borders, creative methodologies, and accepted linguistic cultural practice. Video Lab: Loop Holes (2003) was Kubota’s next public performance sound-installation spectacular. Nine separate video monitors were placed in a grid (3 X 3). Each monitor featured the artist reciting the same improvisational sound poem with the running time of the tape on each monitor advanced by half a second. This collision of sound and image cleverly framed a mediated past to the immediate present and a constantly shifting future. Kubota never completely abandoned his architectural practice, it continued throughout his career as the structural bedrock of his sculptural installations. Passage (1986), Waves (1992), Sonarcissus (1993), Bending Machine (1993) and Hokusai Revisited (2008) are the most obvious manifestations of Kubota’s continuing interest in the field of architecture. A recent performance video, Overwriting & OverVoicing (2010) contains a residue of the architect’s past. Kubota begins Overwriting & OverVoicing by drawing a perfect grid on white paper with ruler and pencil. Then he overpaints the grid using a brush and black ink while chanting in a meta-language—the permanence of his delicate, idiosyncratic calligraphy destabilized by the evanescence of sound play. In 2009, Nobuo Kubota received a Governor General’s Award in Visual and Media Arts, Canada’s most prestigious arts prize. The award is a fitting tribute to Kubota’s tireless work amongst the boundaries of the disciplines constructing and deconstructing beautiful zen-like ambiguities that transcend style and genre.